Now there's nothing to beat the kick you get out of a great meal first thing in the morning. And the breakfast at Vista set me thinking about what would constitute the “best breakfast buffet” for me. The essential part of the buffet is that is should have a lot of variety. But then, all the parts should add up. So here’s what to add and what to leave out of my perfect breakfast buffet. 1.Fruits – lots of them and as many varieties as possible. And those flavored yogurts you get to pour over your fruits. 4. Then it’s over to the savory and hot section. Idlis/vadas are usually my first choice out of the buffet. 7. Coffee to end the great meal. Sometimes, every once in a while, I would go for the Masala Chai instead. 3. Plain toast – simply boring! 4. Baked beans and baked tomatoes – I can’t stand either! 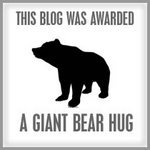 And now, before I sign off...a thank you to Sunshinemom for her giant bear hug. Simran...thats a nice one...and thanks so much for thinking of me..I am so glad for the hug! !..